Yes, I liked it and it did work! No, it was bad or boring but at least it worked. No, it didn't even work! Yes, even though the game didn't work. I'm not sure how I liked it then since I didn't even play it. Then press z and I think it should start! Both pathways will give you a starting level 3 of that weapon! All your other weapons are level 1. Your other weapons are bubbler, fireball, super missiles, and blade. This pathway you start with a level 3 polar star. Although you may instantly think that the machine gun is better, you may be surprised to find out what happens when you reach the boss fight! This pathway you get a level 3 machine gun. You can even fly around with it and maybe try to take a few shortcuts! You keep the machine gun all the way through. The door to the waterway cabin no longer goes to there, but gives you a quick shortcut. Oh, and there's a secret mode somewhere. It's nothing special, but can be fun to mess around in. If you want to find where to get into the secret mode, you'll have to search! You just jump in a water flow and go and explore! There is a door at the end. Oh, and there are two more bonus levels. One is the chinfish course where you have to go through several different obstacles of varying difficulties and try to make it to the end of the course. There's the link please tell me if it works! Alright I guess I'll play this one too. I've been looking forward to this. -Right off the bat, the game is in full screen. Most people like them windowed, so you may want to fix that. -Also, Orgview and Manual are not necessary. -So, once we actually open up the game, we need a nice little intro of Quote swimming through the waterway. The only problem I noticed was that the ground doesn't move with quote or the background. What I suggest doing to fix this would be to make the room really long, and have quote be standing on invisible tiles being and being pushed by the currents instead of using an ANP. Also don't forget to do a FON onto Quote. -The title screen is nothing special, but I like it. I like how you took the time to change the music being played, but maybe next time you should make some custom art as well. -Once you begin, you get to choose a pathway. The cabin is nice, but maybe to give off the impression that it's actually floating instead of just being stagnant, why not have the camera move up and down like the cabin is moving? This would be easy to pull off. Just put one of the sand zone birds on an invisible block under the cabin (or some other entity that moves up and down) and do a <FON onto it when the map fades in, but don't forget to focus the camera back onto the player using FOM when they leave the room. -Since I like the Machine Gun, I chose that pathway. -So, it looks like the challenge is just the Waterway but with some different weapons, but that's alright since you're new to modding. -The weapons are pretty balanced, and not having the booster adds to it as well. I liked how the door acted as a skip instead of taking you out of the challenge. Not a lot of people would think to do that, and would just make it locked. 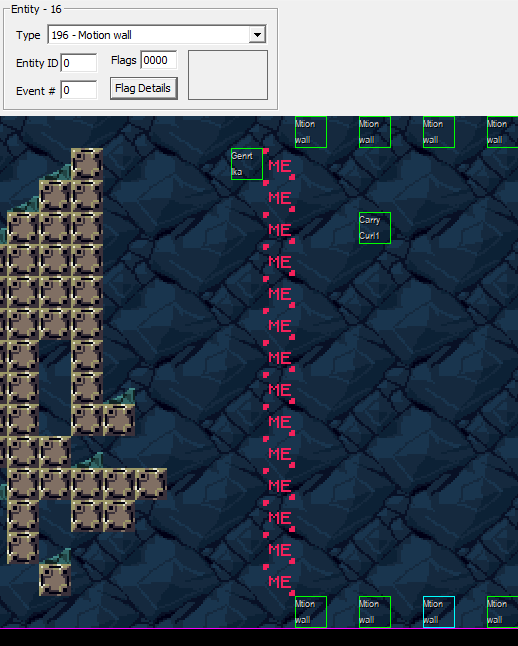 -Ironhead is pretty easy if you just use the missiles, but there are only 20 of them, so it works out. The fight is balanced, and I had a lot of fun. 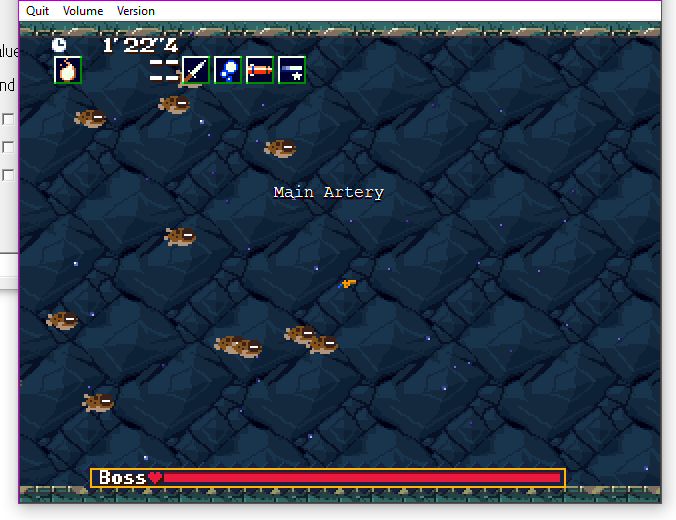 -This mod is a good spin on Cave Story's Waterway. giving the player the spur at the end was a nice touch. Now, on to the bonus level. Water Flow Web. 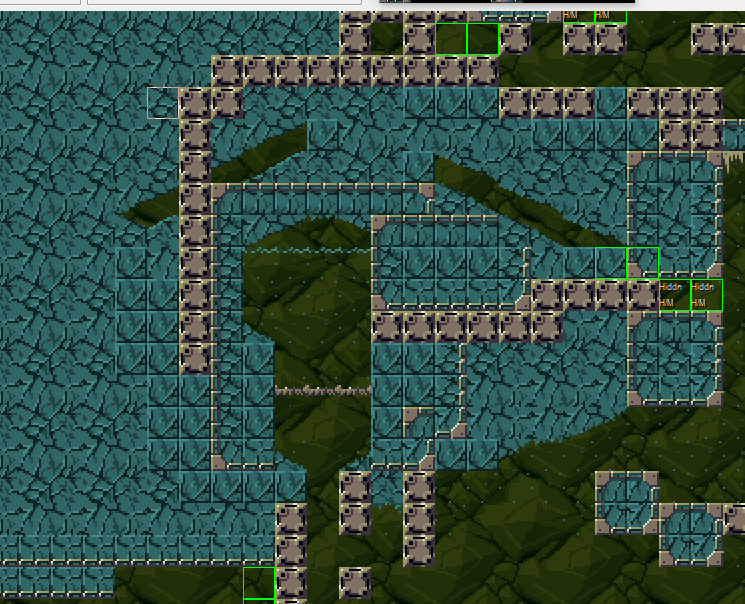 -In this one, you get to swim through the maze-like stream picking pathways. One of which will lead you to a door. -Even though there wasn't much gameplay (apart from the occasional spikes) or enemies to fight, just moving around and memorizing the different paths was fun on it's own. -The parts with the moving blocks near the end were also a nice touch. Overall, I liked it. It's not the best mod, but it's not bad. Keep it up, guy of walrus. (oops i numbered this wrong ill make this zero)0Right off the bat, the game is in full screen. Most people like them windowed, so you may want to fix that. 1Also, Orgview and Manual are not necessary. 2So, once we actually open up the game, we need a nice little intro of Quote swimming through the waterway. The only problem I noticed was that the ground doesn't move with quote or the background. What I suggest doing to fix this would be to make the room really long, and have quote be standing on invisible tiles being and being pushed by the currents instead of using an ANP. Also don't forget to do a FON onto Quote. 3The title screen is nothing special, but I like it. I like how you took the time to change the music being played, but maybe next time you should make some custom art as well. 4Once you begin, you get to choose a pathway. The cabin is nice, but maybe to give off the impression that it's actually floating instead of just being stagnant, why not have the camera move up and down like the cabin is moving? This would be easy to pull off. Just put one of the sand zone birds on an invisible block under the cabin (or some other entity that moves up and down) and do a <FON onto it when the map fades in, but don't forget to focus the camera back onto the player using FOM when they leave the room. 5Since I like the Machine Gun, I chose that pathway. 6So, it looks like the challenge is just the Waterway but with some different weapons, but that's alright since you're new to modding. 7The weapons are pretty balanced, and not having the booster adds to it as well. I liked how the door acted as a skip instead of taking you out of the challenge. Not a lot of people would think to do that, and would just make it locked. 8Ironhead is pretty easy if you just use the missiles, but there are only 20 of them, so it works out. The fight is balanced, and I had a lot of fun. 9This mod is a good spin on Cave Story's Waterway. 1In this one, you get to swim through the maze-like stream picking pathways. One of which will lead you to a door. 2Even though there wasn't much gameplay (apart from the occasional spikes) or enemies to fight, just moving around and memorizing the different paths was fun on it's own. 3The parts with the moving blocks near the end were also a nice touch. im glad it actually worked! I prefer fullscreen myself as well aside from when I'm modding but it tends to be a bit messy in that it doesn't work well for everyone. As for the mod, I've got not much to say though the waterway maze is not too bad, though I stopped when I got send back to the start while I was not sure where to go. I don't feel you HAVE TO make it 640x480 but it's something people prefer. It's not perfect but you get the idea I'm trying to get across. The waterway maze was extremely basic but kinda fun, I like the whole thing with the joke spike; it's neat. The opening is weird with Quote walking on water? Also make sure you switch out the floor and ceiling to "motion wall" or entity 196. I think it's a good mod, just needs some more work, the mod's not the best but you're getting better at it, keep it up, you'll only get better! I think you should give the player the map system, but not right off the bat. Maybe hide it in the maze? how do i use motion walls? Yeah I get what you mean, it's hard to do that stuff with ANP and such and making it look natural. As for the Motion Wall you set the entity however you want as a ceiling and or floor. 0X1000 gives us the "reverse" effect for something if there is one in CS's engine. Yeah I'm Doukutsu Trainer, if it's good for me it's good for anybody. Oh wow I didn't know about motion walls. That's actually really cool. 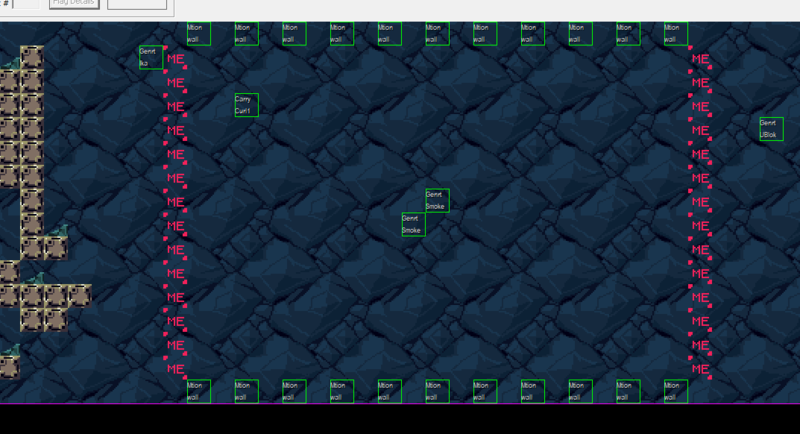 if my thing has more tiles on the bottom how would i make those move?? The door to the waterway cabin no longer goes there but gives you a quick shortcut. <PRI<MSG<TURHi this is my mod.<NOD<CLRI hope you enjoy it!<NOD<END. I hope this helps! which room is it in? I'll try to fix it, thanks for the feedback! You have to make it through 5 obstacles to get to the finish line! Alright! Been looking forward to the update so here are my notes. -The intro and title are still the same, but that's OK. They don't really matter to the mod, but it'd still be nice if you updated them a bit. -The Sky Cabin now shifts up and down like I suggested, and this looks way cooler than I thought it would. Nice job. -Once in the Chinfish Course, I noticed the tiling was really well done. This is really nice stuff. -Maybe add a save point in it in case you die. -I think the explanation for the 2nd part of Fantastic Flow could be better. I saw the spike in the middle and went for the top anyway. -Apart from that, I don't think there's much else to add. It's a nice little obstacle course. I do really like the concept, and I think it should be expanded upon. Those are a lot of cave story reactions! Wow, how was it possible to make the first room move up and down?